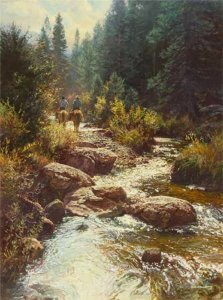 Follow the River by Bob Wygant ~ Artist Bob Wygant holds a special place in Texas and the Western heritage he has painted throughout his career. "I am interested in establishing a mood in my paintings and not a meaning. It is the viewer who brings the meaning to the work," says Wygant.